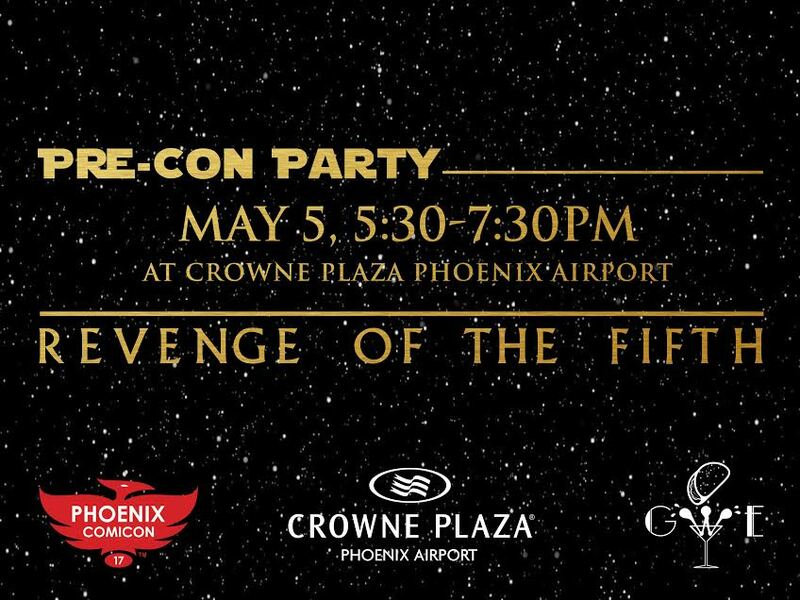 Get pumped for Phoenix Comicon in style this year with a “Revenge of the Fifth” fan party like no other! Join us along with Phoenix Comicon and the Crowne Plaza Phoenix Airport Hotel (an official Comicon hotel provider who is just a hop, skip, and a jump from the con on light rail) for a happening happy hour featuring Geeks Who Eat signature cocktails (created just for this event, recipes to follow), passed hors d’oeuvres, and poolside games, music and epic connections. One (1) Gift Certificate for a 3 night stay at the Crowne Plaza Phoenix Airport Hotel (May 25 – 28th 2017during Phoenix Comicon). Includes breakfast. One (1) Gift Certificate for Dinner for 2 at the Post (on-site restaurant) Includes tax & gratuity, does not include alcohol. One (1) Gift Certificate for a “Park, Stay & Go” package. Valid for a one (1) night stay (based on availability) with up to fourteen (14) days airport parking at the Crowne Plaza Phoenix Airport Hotel. RSVP now for FREE and bring a friend, you won’t want to miss this Revenge of the Fifth Happy Hour!